A fifth successive year of growth, numerous awards and a growing number of employees – it has been quite a year for the bartlett mitchell team. “A large part of our success is down to the investment we’ve made in our teams, a key part of this has been our chef’s training”, says Wendy Bartlett, executive chairman of the business. A significant investment has been the partnership we have forged with Adam Byatt, who recently secured a Michelin star at Trinity, his Clapham-based restaurant. Adam joined bartlett mitchell in 2015 as chef consultant, working closely with Pete Redman, chef director at the company. Adam’s training is a core part of the work he does with the company. By using his front-line restaurant experience, the company is able to tap into the latest food trends; whether its the use of produce, the latest cooking techniques or service standards. Adam really does feel part of the team. We are always talking to each other about new ideas, sharing recipes and the latest food trends. We have forged a real partnership. Adam said: “It’s great to work with Pete and we use each other to bounce ideas off. The company’s culinary development programme is thorough. Chef Academy courses range from monthly sessions with Adam and me, core butchery skills, and even practical kitchen management. These all feature as part of a series of academy workshops aiming to train, engage and motivate their teams. In the last year, bartlett mitchell has trained over 100 chefs with Adam. Outside of this, we have also provided training for almost 700 people on level two training for both ‘Food Safety’ and ‘Health and safety’. These core national qualifications have also extended to senior managers who Wendy believes need to understand exactly what’s happening on the ground. The company’s ‘Delivering Innovation’ workshops take chefs and site managers on escorted tours to food hotspots to enable them to identify the latest food trends. We give our teams access to as much learning and insight as possible. They take these back to their workplaces and to inspire their menus. bartlett mitchell’s approach to food is very simple. We want people to feel empowered to make the choices which are right for their businesses. We don’t believe in dictating from the centre. For teams to be engaged, they need to feel ownership. That’s why bartlett mitchell provide them with the ability to discover their own food journey and implement them as they see fit. The industry moves so quickly that we need to ensure that we are constantly learning and developing. This mindset is something we instil in our teams. The focus on ‘mindset’ is something I am passionate about. 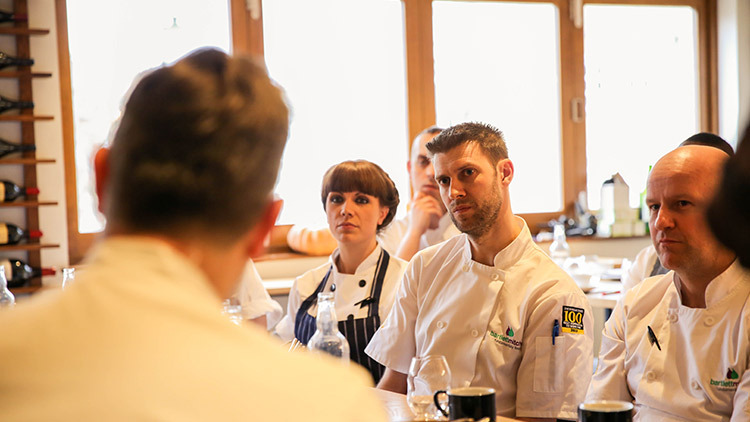 So much so, that we recently introduced a workshop which focuses on the ‘Chef’s Mind’. We know how demanding it can be to work in a busy kitchen so we spend time working on how to manage these pressures in a way that really gets the best out of our people. It’s about understanding our potential and thought processes when writing a menu or developing a dish. Where one of our chefs might see something as simple as a cauliflower or a beautiful turnip, the other may think about roasting it whole with sea weed butter or nukafermentation. I want to explore that with the chefs so they can open a whole new range of doors and ideas. Only then can you get that competitive edge. I want to spark something special and infect our teams with a process, and different way of doing things. My passion extends to the industry as a whole. There is a misconception about chefs in our industry. If it was up to me, we’d cut a hole open in every kitchen we work in, so customers can see the brilliant work our teams do. What’s clear is that the company is building a strong foundation and, as Wendy explains, it will be crucial to the long-term sustainability of an industry which serves so many people every day. Skills shortages are not just an issue for now. Recent political developments could exasperate the issues we already have. It’s important to put measures in place to attract, retain and inspire our people. Our training isn’t just about now. It’s about the future. To find out more about our training and how it could improve your workplace catering contact us.